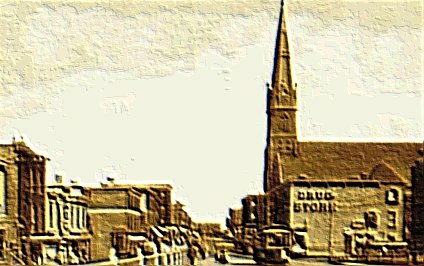 This page will chronicle the lost buildings, forgotten streets and alleyways, and defunct businesses which once called Spondyville their 'home'. 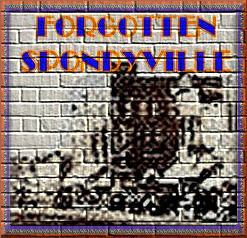 If you spot something of interest while strolling the streets of Spondyville, just drop a line to the Spondyville webmaster and he'll check it out and report back. 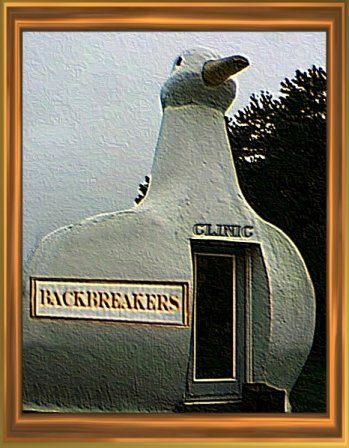 The Backbreakers Clinic was a family business, which, surprisingly, lasted for almost 30 years on the outskirts of Spondyville, but which finally, (and mercifully), closed its doors for good in April of 1981. The business was run by the Bellicose brothers, Billy and 'Bix'. 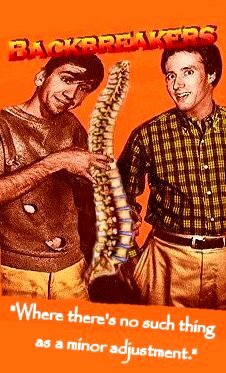 Their woeful ignorance of human anatomy in general, and Spondylitis in particular, was stunning, to say the least. Their whereabouts now, are unknown. For many years, the business was headquartered in a building, located just off Subluxation Square and the corner of Quackworthy Rd., which offered a silent comment on the services provided within. "Backbreakers, it's more than our name, it's what we've done to you since 1952." 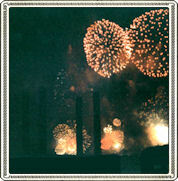 Photo of the Elixir factory taken in the midst of the 1932 fireworks display, during which, it has been rumored, an errant spark landed into a vat of elixir, causing the factory to burn to the ground. Early color photo of the Winklesnot Rheumatiz Elixir factory circa 1930. 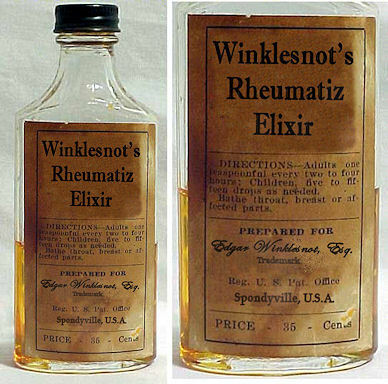 From 1885 to 1932, Spondyville was the home of Winklesnot's Rheumatiz Elixir factory. The elixir was extremely popular around the turn of the 20th century, and even today, some of the old-timers recall it with nostalgia. By today's standards, of course, it was only slightly better than snake-oil, but it's delightful fruit flavor (and high alcohol content) made it a must-take supplement to every Spondyvillean's regular medical treatments. The factory, which was noted for it's four imposing smokestacks, was totally destroyed by fire in 1932, rumored to have been started by a spark from the annual Spondyville Fourth of July fireworks display.